In Queen Elizabeth’s time, this herb was considered an emblem of fidelity to lovers and was worn at weddings, funerals, and to give to friends. They were used in sick rooms to “correct the air” when infections were present. The dried leaves were shredded and used in a pipe like tobacco to help a cough. Used in herbal or tobacco mixtures in England, where smoking was first introduced by Sir Walter Raleigh. The ashes of burnt Rosemary was rubbed on loose teeth to fasten and beautify. 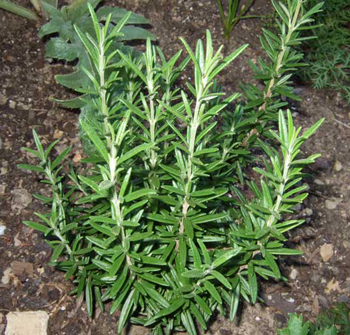 Rosemary’s name is derived from its Latin name Rosmarinus, meaning “dew of the sea” and referring to its blue flowers or to the fact that this herb thrives by the seashore, especially in Spain where its thick growth covers the cliffs. 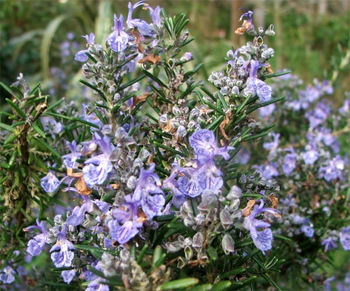 To explain the range in the color of rosemary’s flowers from a pale bluish-white to a deep blue, Christian legend claims that flowers were originally white but were turned varying shade of blue when Mary hung her blue cloak over a rosemary bush. Since the rosemary plant seldom grows higher than a man’s height, it was believed that rosemary grew to the height of Christ in 33 years, and after that it grew thicker but not higher. A valuable heart and liver tonic and also helps reduce high blood pressure. Used to treat ‘nerves’, digestive disorders, palsy, weak memory, dizziness, migraine, dandruff, stimulates hair growth, restore appetite, gas, clears sight, jaundice, consumption, and menstrual pains. stomach, intestinal tract, and kidneys. PubMed.gov: Suppression of the nuclear factor-kappaB activation pathway by spice-derived phytochemicals: reasoning for seasoning.